"This is the original Girl Scout Cookie from back in 1922. They are a sugar cookie cut into trefoil shapes (like the Girl Scout emblem), and sprinkled with sugar crystals." Combine the cream, butter, and sugar. Next, add well-beaten eggs, then milk, vanilla flavoring, flour and baking powder. 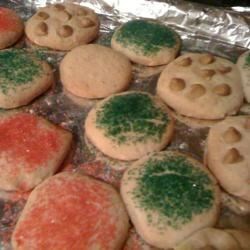 Roll thin, make trefoil cutouts, sprinkle sugar crystals on top, and bake at 350 degrees F for about 8 minutes, or until just golden brown. Good little recipe. Trefoils aren't my favorite but this is a nice recipe to have. If the dough is too sticky for you just make sure you are working with a floured pin and surface. Cookies tasted good, but the first line says add cream to butter and sugar. There is no cream in the ingredient list. As a Girl Scout Leader, we created a Sweet Shoppe workshop for over 25 Girl Scouts. This was so much fun and the girls were able to experiance Girl Scout History. They loved them. THIS IS A WONDERFULLY TENDER COOKIE WITH GREAT TASTE. It is a good tasting cookie.